Bathroom mirrors are an essential component to your bathroom vanity. From the beginning of your day to the end, you will always be using it when you step in your bathroom. Bathroom mirrors come in a wide selection of stylish and elegant styles to match the design of you bathroom space. Whether it is a simple upgrade or a full remodel, find some of the best bathroom mirrors with Luxury Living Direct. 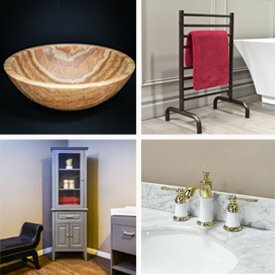 Learn about Luxury Living Direct's custom vanity program. If you see a bathroom mirror below that matches a vanity or piece of cabinetry that you like, give us a call at 1 (800) 574-3022 and we'll give you a quote! New subscribers receive $15 off your vanity purchase.